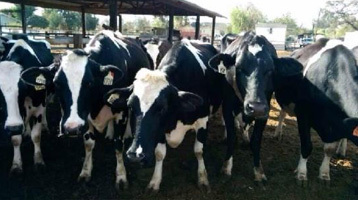 GrubMarket is hosting a dairy farm bus tour at San Martin Milk Company on Sunday 10 A.M.- 2 P.M. November 16. This is a great opportunity to bring your family to see the cows at the dairy farm and learn about the milking process. Get a first-hand look at where our cows live, what they eat, and how they are milked. Learn how our milk is processed (this includes a tour of the processing plant or viewing the actual process, along with a description of each step our milk goes through before it ends up on your table). Learn why Raw Milk is much better, what is the benefit of Raw Milk for the human body. It is a working dairy farm. Comfortable casual attire is suggested. Fresh premium dairy products are available at the end of the tour. We are committed to making your visit to the farm both educational and fun! Children should have the opportunity to learn that their food (especially milk) is produced on a farm and is not just a product at the local grocery store. Our goal is to provide a good learning experience at the farm where you will have fun and build memories that will last a lifetime!